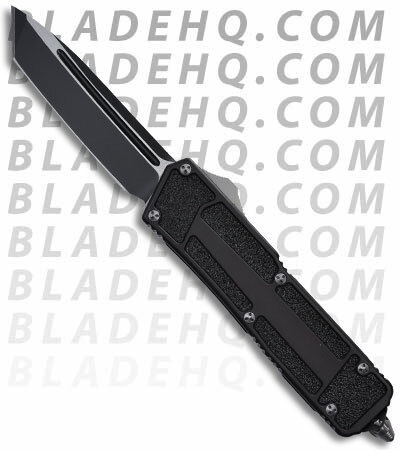 The Microtech Scarab is perhaps the mother of all out-the-front automatic knives. The Scarab is double action meaning is fires both out and in via the slide button located on the right side of the knife. Action, lock-up and quality are all Microtech-top-notch. The Scarab has a beautiful tanto black S30-V blade and black anodized T-6 aluminum handles (with grip inserts). Black pocket clip contains serial number and production information for the knife.